Yesterday was no different from any other day for our eldest daughter, she rose at 6 a.m., had a quick breakfast before getting ready for work. She doesn’t get dressed up for her job, its work boots, a bright orange shirt, and overalls. Her job for the summer? She cuts grass for the city using either a weed whacker or the cutter. She enjoys her job very much; she’s working outside in the fresh air, its physical labour which keep her in shape for soccer (she’s keeper). There are a couple of issues she does have to deal with, first she is allergic to grass, trees, and outside ground mold but she has learned to deal with those allergies. Second issue, which I think is more of a problem, is dog poop. There she is working away, and what does the weed whacker hit, not one but two bags of dog poop. Now there is flying dog poop, nowhere to run or get out-of-the-way, because it all happens in a quick second and her face is splatter with poop, lots of poop. 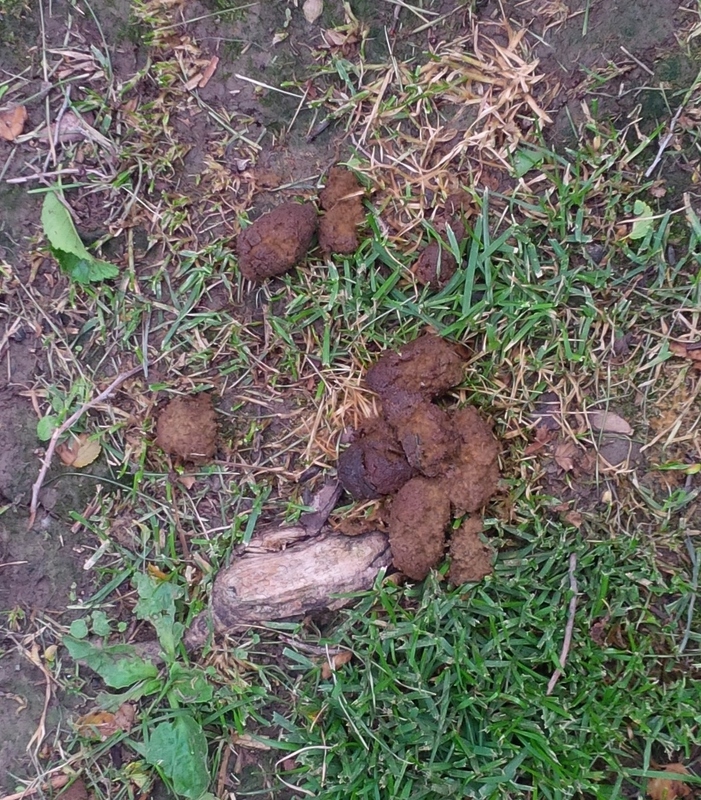 Dog poop in our backyard, which was picked up after taking this picture. “Oh f***, where am I to get cleaned up?” There are no washrooms in this park. Ahh, she spots a puddle. That’s water from the sky, it must be better than the dog poop on her face. So there she is, splatter with dog poop, dipping the only Kleenex she can find in her pocket, washing her face. She dries her now somewhat cleaned face with her grass stained t-shirt and goes back to work. Mom’s question: Why would someone take the time to put the dog poop in a bag, then toss it on the ground? This entry was posted in City parks, Dog, dog poop, dog waste, dog waste, dogs, Employment, flying poop, Grass and tagged Pets, pets, Students, Summer job, summer job, washing, weed whacker on June 18, 2014 by AlwaysARedhead.